Not only is GB yet again favouring specific devices with instant sale and giving an unfair advantage. But yet another move to assist heavy BC usage/buying and not learn the intricacies of the game thru genuine achievement. Fully agree with you, it's becoming so unreal with these new update (instant sell). I hope they will remove it cause it's getting out of hand with all those transfers. @hans-orf I didn't see this , could you tell me where I can find it ? @robert_haker Only available to iOS which stinks of giving advantage to a specific device. Almost could think GB get some kickback from Apple for always placing them as priority. @hans-orf are you disagree because you don't have this feature or because users who have it must pay BCs to use it? Firstly I think it is a bad idea as it gives unfair advantage to heavy BC users and this is not really authentic as GB claims they want the manager to be. It removes any management skills for working out how the transfer list functions. At least disable it for mobile battles as this is less about management as a crew battling team but more how much BC clout you have. It makes it pointless to go up against teams who have a lot of iOS users. If it must remain for mobile battles then perhaps selection of crews with device comparability could be possible. Likewise if it must remain then surely you should have device parity. It really plays into the hands of iOS users. Imagine a crew with only iOS users v a crew of browser users, this unfair advantage makes it about what device you have and not what skill in the game you have. If the software wants to go global then surely you should be considering such things as device parity. Almost like Xbox having more functionality for Elder Scroll MMU games than PS. @Hans-Orf , @Adhurim-Dakajj , @jeffro-davies , @Markez17 , @robert_haker , all moderators,..
For me.., this is not about you have ios device or not. It's not about you already have this feature or not. If you want to know the answer is yes, I have it already. But that's not the point. This is also not about you must pay BCs to use it or not. But this is about the game itself. It's about OSM that we love.. I'm fully aware that GB want to make money as much as possible. Every online games do the same. But please, don't be a suicide..
With this "instant sale" feature, you can turn a worst team into a super team just in prep days, and even before this game started. So, where is the management skill? Where is the most often online users? Where is the fun fair of this game? OSM should give advantages to them. Every online games should do the same. Don't you think so?.. If.. for any reasons, you decide to implement it anyway, I suggest you make the option for moderator of the league can turn it off.. I really hope that Gamebasics will listen to most of us and delete this instant sale thing. It is the end of what was a wonderful application. I already used it to create a mighty team in 1 hour using just 250 coins ! and wolvs ain't a big team . 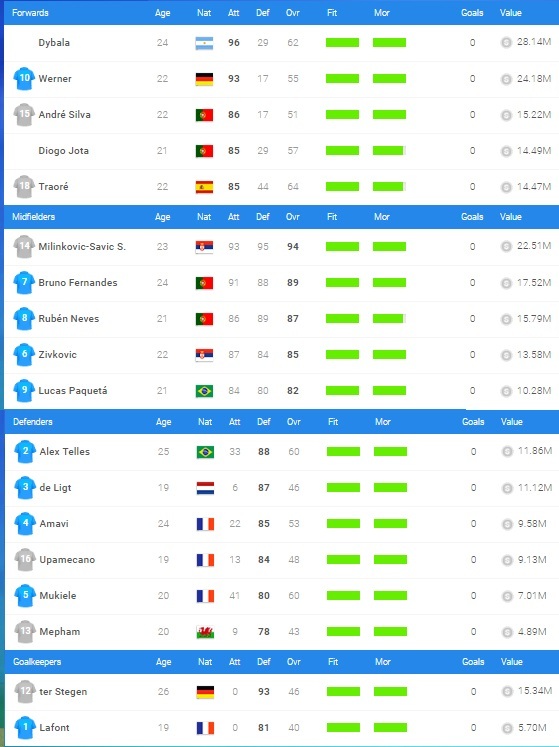 imagine if I had spurs squad value ? Agree 100% and iOS users can clean up on the other device users with little effort. And in the cup final. Hello guys, this feature is absolutely scandalous! You cant give it only to ios version! And at the same time android users even don't get information of this. I love this game, and i agree with most players in this thread, i would rather drop this feature. But if u are after the money at least you must offer it to everyone. So many money, so many hours i spent in this game, but i wont pay any more single cent from now on! Thanks GB for messin up your own lil masterpiece! Recently received a message saying they are disabling QuickSell. I'm just wondering, why there is not a post from someone in charge about this matter. Because it's only a trial? Because there wasn't a post when they try at the first place either? Ok. It's only a suggestion for GB. Next time you want to make a trial about something (when it starts and ends), please let your customers know. It's more fair to all managers. And it looks profesional. Btw.. thx for the info, mate..